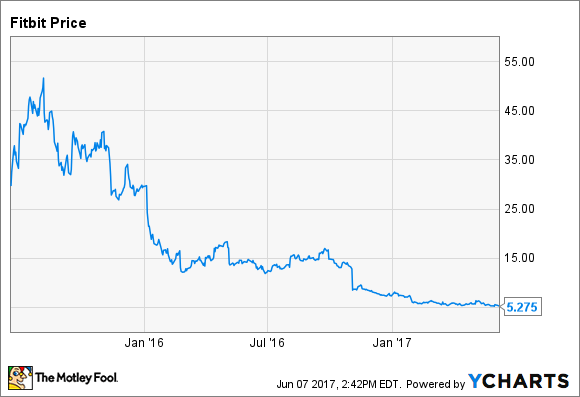 Is Fitbit Becoming a Value Stock? After being beaten down, shares of the fitness wearables company are cheaper than ever. But are they cheap enough? This article was updated on June 7, 2017, and originally published on Jan. 18, 2017. Fitbit (NYSE:FIT) began its publicly traded life as a high-flying growth stock, soaring in the days following its mid-2015 IPO. The fitness wearables company was worth nearly $11 billion at its peak in late 2015, with investors betting that its popular and inexpensive fitness bands would drive growth for years to come. That growth story fell apart in 2016. The company ramped up its spending dramatically, more than doubling its research and development headcount in a drive to bring new products to market quickly. This spending knocked down profits, but it led to multiple new products that appeared to position Fitbit well for the holiday season. Unfortunately for investors, the holidays were a disaster. Revenue tumbled and profits turned to losses, confirming fears that demand for Fitbit's products had fallen off a cliff. The stock was hammered throughout 2016, losing about 75% of its value. Fitbit's market capitalization now sits at just $1.2 billion, significantly less than the company's expected sales in 2017. If Fitbit can't return to growth and start moving toward profitability soon, the stock could fall further. Despite all of this, Fitbit certainly has some value. Its products are still popular despite weakened demand: The company sold 3 million devices during the first quarter. Fitbit's brand is still strong, although a lack of innovative new products could test that strength. The global wearables market actually grew briskly during the fourth quarter of last year, expanding by 16.9% according to IDC. But Fitbit's sales plunged, as it was unable to convince its install base to upgrade. The company is facing heavy competition, not only from the Apple Watch, but from Xiaomi and Garmin as well. And traditional watch makers are likely to push into the wearables market sooner rather than later. I've argued that Fitbit's unending need to come up with innovative products is a good reason to avoid the stock altogether. But as the stock continues to decline, it gets more interesting. I'm not sure it's quite cheap enough yet, given the problems facing the company, but it's getting close. Fitbit now trades for just 1.25 times book value, down from more than 12 soon after its IPO. That's well below the S&P 500, which sports a price-to-book ratio over three. Fitbit's balance sheet is cash-rich, which makes investing in the company less risky. At the end of the first quarter, Fitbit had $726 million in cash and no debt. This gives Fitbit the ability to make investments to drive future growth, and to absorb losses this year. The market is valuing Fitbit's business, after backing out the cash, at less than $500 million. Fitbit does expect to burn cash this year, but it's clear that investors are not very optimistic. I wouldn't call Fitbit a value stock just yet. While the stock looks cheap, there's no telling how long the revenue declines and losses will persist. Fitbit is on my watch list, though, and I'll be tempted to jump in if the stock goes much lower.